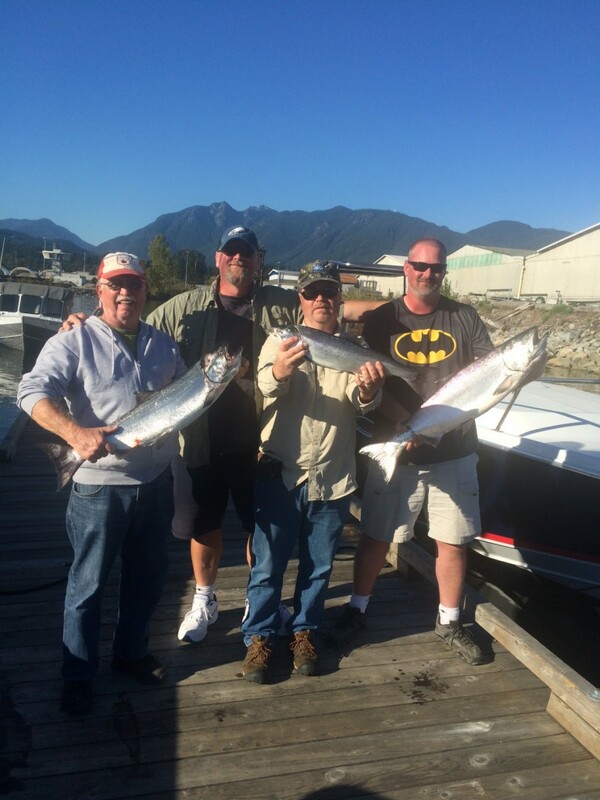 We’ve got another 2-3 weeks left for fishing for salmon off the beach. I have had a few reports of coho and chinook caught on gear so the fish are definitely around. Remember to keep your eyes on the water as any sight of a fining fish could change your luck. Don’t look for jumpers, as fresh fish don’t leap out of the water so this is where sight fishing is very important. Instead of casting non-stop, hold the fly in your hand with your line stripped off the reel in your stripping basket and ready to cast. From Tuesday onwards the low tides are in the morning so if you want to have another shot to catch a salmon off the beach this is the time to do it. It’s mid September and that means we are coming to the time of year where we start to see more white springs. Right on queue the Cap Mouth has picked up late this week and there have been some pretty big fish caught, a few around 30. Fishing will be good off the Cap the next few weeks as the numbers of fish build up. If we get some big rains, then the fish will go up the river and fishing will slow down. There have been a few challenging days out on the water this week. Primarily due to Orcas visiting both the North and South arm of the Fraser River and a good chunk of the chinook slipped up the river with the rain. That said there are still plenty out there, we just have to work a little harder to find them. Bell Buoy, North arm, T10 and Sandheads have all had their share of slow days those have been matched with days of excellent fishing. So you just need to get out there and fish! The same gear we’ve been using in our last few reports and the 40′ to 80′ range is best. Just before I wrote this report I suggested those depths to a past graduate of our saltwater course. He texted me back minutes later with another big fish he got this season, He hooked it at 80′ at Sandheads late yesterday afternoon. 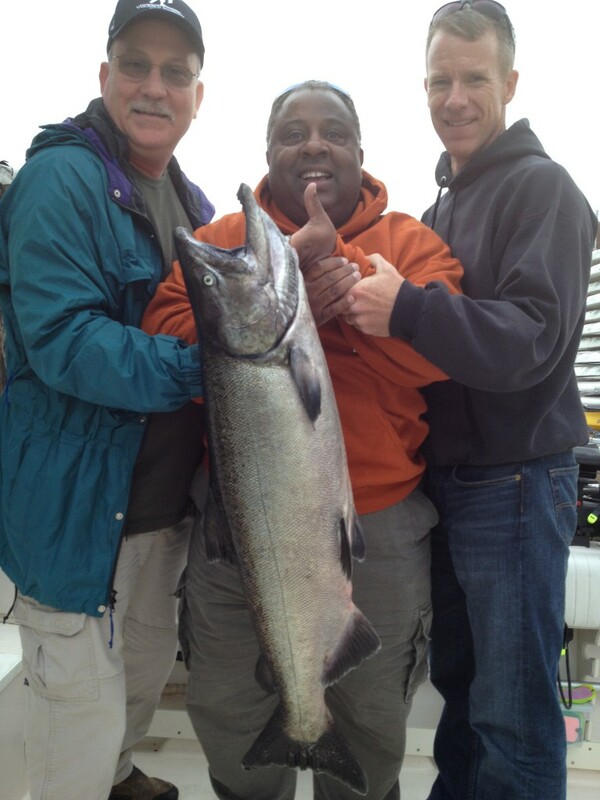 Mastering Local Saltwater Salmon Course graduate with a beauty landed at Sandheads this week. 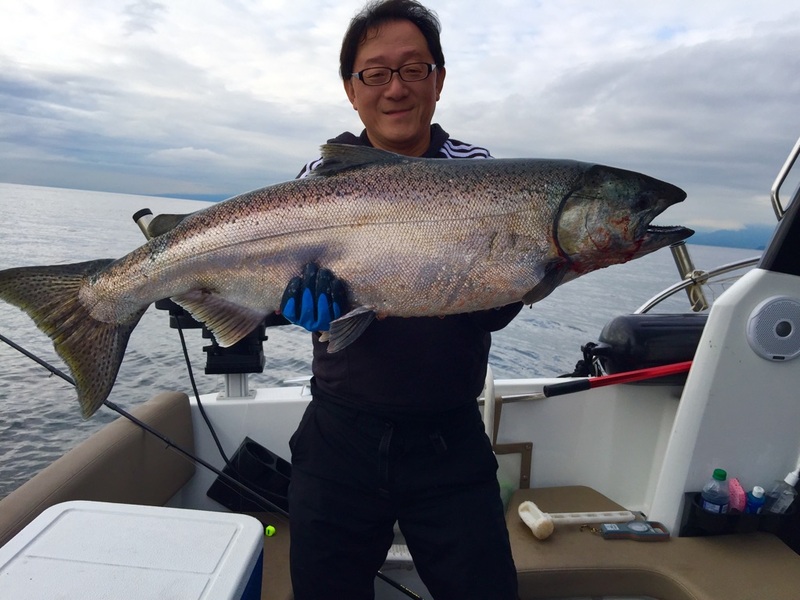 Most of the boats based out of Vancouver have been targeting chinook at the mouth of the Capilano, It’s hard to beat this fishery but it’s also very popular. It too has had its slow days and hot bites but it’s producing fish daily. The really good news is there are some BIG chinook in the mix! A couple of days ago we hooked what seemed like a freight train that almost spooled the reel! We had to back down on it but unfortunately the fish outsmarted us by finding another boat’s downrigger wire. You’ll know it was our fish if you see it towing a Chartreuse Glo/Moon Jelly Flasher with a Light Spackle back Teaser head. A couple of trusted fellow captains did see some big fish they lost. One was in the 30lb range and the other captain that lost one at the net said it was the biggest fish he’d seen this season at 40+lbs! Not bad for an afternoon on the water. Typically the mouth of the Capilano is very good this time of the year with the peak of the fishery still to come. A good percentage of the fish are still chrome and more and bigger cohos have also been hooked this week. All the action has been at or near the bottom. Anchovies have been the bait of choice this week. With that said I did hook a good fish with herring yesterday afternoon this is also a good time to go naked! By that I mean running either an anchovies or herring with no flasher. This has to be my favorite way to battle the big slabs without the added drag of the flasher! I look forward to this every year around this time and I’ll be trying that all weekend!